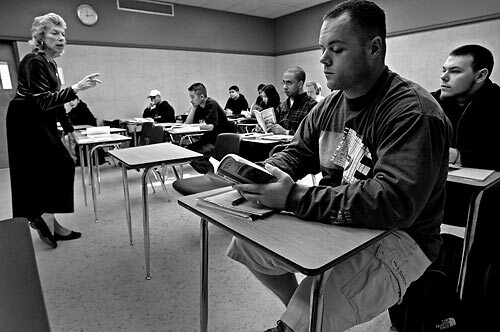 Mike taking an English 1 class at Soloano Community College with teacher, Laurie Duesing. When he was 19, Mike Pendergast was sentenced to 14 years to life in prison after being involved in a Vallejo, Ca., crime spree that included carjacking, kidnapping and armed robbery. He received a 14 years to life prison sentence, but, he became a model prisoner, using sports to help break down the racial barriers in the notoriously segregated prison yard. After getting paroled last year, after 10 years in jail, the 31-year-old Pendergast is the oldest freshman to play on the Solano Community College football team, in Fairfield , Ca., playing defensive line while putting his violent past behind him.